Vocabulary instruction is essential to a students understanding of text! It must be planned and explicit instruction. It is one of the five core components of reading instruction. 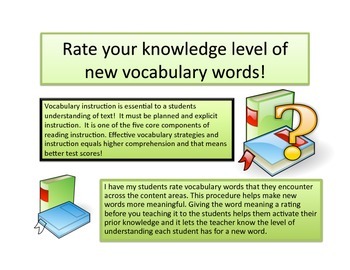 Effective vocabulary strategies and instruction equals higher comprehension and that means better test scores! 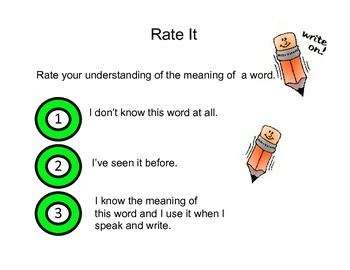 This way of teaching vocabulary and meaning works well with students at all academic levels and at all grades. 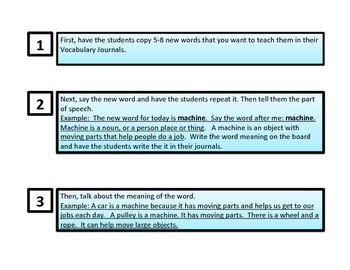 Included are steps to teaching vocabulary, poster for rating your knowledge, and the step made shorter so that you can include them in your lesson plans.